This bright teal lace dress is cute and versatile--this is a cute summer dress to wear with heels or wedges. Then, wear it into the fall as a party dress. You can wear this dress year round, depending on how you accessorize. The Teal Swoon Bow Belt Teal Lace Dress is fully lined, except at the neckline, sleeves, and top back, which are semi-sheer. 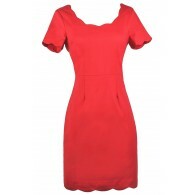 It is made of a teal floral lace and features half sleeves and a fit and flare A-line cut. An included belt with a bow in the front wraps around the waist and completes this dress. The Teal Swoon Bow Belt Teal Lace Dress would look nice paired with pumps, wedges, or heels. You can easily replace the belt with a fabric sash to create a completely different look. Details: Lined. Hidden back zipper. Belt included. 100% polyester. Lining: 100% polyester. Remove belt. Machine wash cold delicate cycle. Use Non-chlorine bleach when needed. Tumble dry low. Remove promptly. Cool iron. Size 3 measurements: 33". Bust: 32". 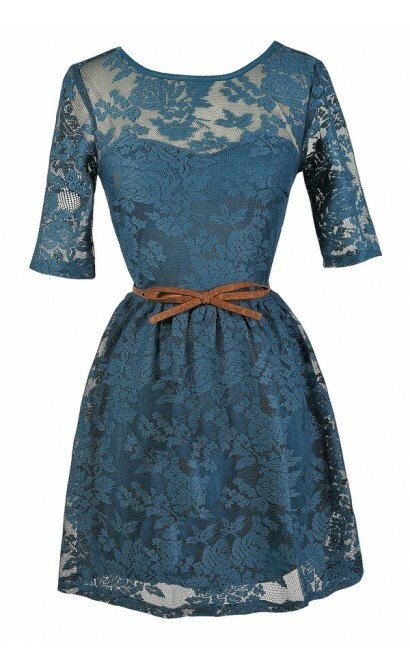 You have added Teal Swoon Bow Belt Teal Lace Dress into Wishlist. You have added Teal Swoon Bow Belt Teal Lace Dress for Stock Notification. You have set Teal Swoon Bow Belt Teal Lace Dress as a loved product. You have removed Teal Swoon Bow Belt Teal Lace Dress as a loved product.